It have been 3 long years missing you people. That’s why we’re putting the band back together. Our hearts are still burning, our fingers are itchy and man, our blood is boiling! We’re gonna do our first show at our 10 year anniversary on April 5th at ACU in Utrecht. Oh yeah, we will probably record new stuff this year as well. Don’t tell us we didn’t warn you. 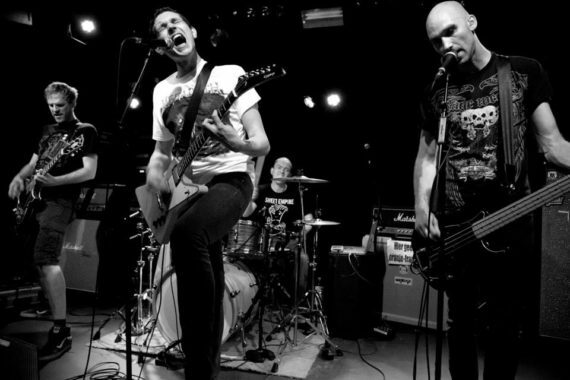 On January 23, 2010 Dutch punkband Smash The Statues played their last show. Exactly 3 years later, the band announces that they’ve reunited. After several members have played in bands such as Antillectual and Break Character, it was time to get together again. The band quit in 2010 because of different opinions about the direction of the band. Three years later the band is on track again, Smash The Statues is back! This won’t be a one time only reunion, the band is planning to hit the studio later this year to record a successor for 2008’s LP “When Fear Is All Around Us”. Between the start in 2003 and the break in 2010, Smash The Statues played with acts as Propagandhi, Strike Anywhere, Beatsteaks, Strung Out, Modern Life Is War and so on. They toured all across Europe, from Norway to Romania and almost everywhere in between. To celebrate their reunion, Smash The Statues is playing at ACU in Utrecht, The Netherlands on April 5 2013, exactly 10 years after their first show ever. Jonas Meens liked this on Facebook. Daantje Bons liked this on Facebook. Cindy Kuper liked this on Facebook. Tom Domela Nieuwenhuis liked this on Facebook. Peter Kwint liked this on Facebook. Brechtje van Doorn liked this on Facebook. Jos Swartjes liked this on Facebook. Máteja Horvat liked this on Facebook. @smashthestatues ik denk niet dat ik in mijn leven ooit zo blij ben geweest! Chris Dols liked this on Facebook. Rick Hovens liked this on Facebook. Tirza ter Haar liked this on Facebook. Thomas Mennen liked this on Facebook. Stijn Vat liked this on Facebook. Mirjam van Hunnik liked this on Facebook. Snaar Kramer liked this on Facebook. Paula Van Dijnen liked this on Facebook. Jasmijn van Mil liked this on Facebook. Nico van Montfort liked this on Facebook. Angus Yang liked this on Facebook. Boris Loman liked this on Facebook. Ryanne Bolhaar liked this on Facebook.